THE BEST, REUSABLE WATER FILTER: Stop wasting your money on poor quality, disposable water filters. This incredible backpacking water filter can be used countless times as it can last for an amazing 1500 water bottles! What is more, it contains no chemicals and it leaves no aftertaste behind. Last but not least, it can save you time as it features the quickest flow rate of 450ml (15 ounces) per minute! 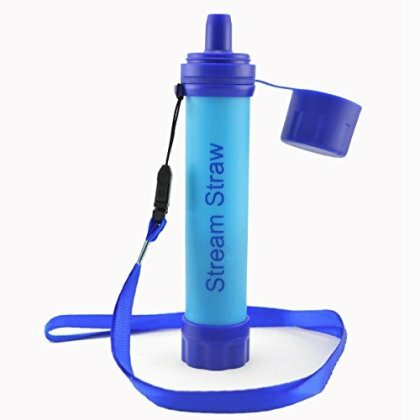 MAXIMUM PROTECTION AGAINST BACTERIA AND PARASITES: The Stream Straw drinking water filter features a unique 0.01 microns, 8 step filtration that assures maximum results. It can successfully remove at least 99.9% of protozoan parasites, bacteria, dust, sediment and algae, providing you with perfectly clear, safe, potable water. LIGHTWEIGHT, PORTABLE DESIGN: Forget about bulky filters that are too heavy and take up too much space. This top notch reusable survival water filter is extremely lightweight, weighing no more than 2 ounces. Furthermore, it is very slim, allowing you to easily keep it in your bag everywhere you go. IDEAL FOR EVERY ADVENTURE SEEKER AND OUTDOORS ENTHUSIAST: This premium quality, incomparably effective water filter is a necessary tool for every hiker, camper, backpacker, traveler, explorer, survivalist, fisher as well as anyone who wishes to have access to crystal clear water at all times. 100% RISK FREE PURCHASE: Providing you with the friendliest customer service has always been our number one goal. This is why we offer you a full refund in case this drinking water filter does not live up to your expectations.